Genomics, Medicine, and Pseudoscience: The new Star Trek series gets biology terribly, terribly wrong. The new Star Trek series gets biology terribly, terribly wrong. The new Star Trek: Discovery series is based on a massive scientific error. Can it survive? It didn't have to be this way. Those of us who have followed Star Trek through its many TV series and movies, including the excellent trio of recent moves (2016's Star Trek Beyond is the latest) were eager to jump on board the newest show, Star Trek: Discovery. Despite some rather uneven acting in the pilot, I was willing to give it a chance. So were millions of other Star Trek fans. Episodes 4 and 5, released on October 8 and 15, revealed that the USS Discovery, the ship that the series revolves around, has an advanced form of transport that allows it to travel anywhere in the universe instantaneously. Unlike all previous Star Trek transport tech, this one uses a biological mechanism, based on mushrooms. Yes, you read that right. The DASH (Displacement Activated Spore Hub) drive uses mushroom spores as its power source. They've discovered a special fungus whose root system extends "throughout subspace" all over the galaxy. Using spores from this fungus, the ship can jump into subspace (or something like that) and jump out somewhere else in real space, light years away, in a matter of seconds. As bizarre and this sounds, the worst is yet to come. To power its DASH drive, the Discovery maintains a large greenhouse full of spore-producing mushrooms. (Mycologists might love this, but how big a fan base can they be?) The problem for the Discovery, in the first few episodes, is that the experimental drive will only let them jump short distances. from E. Schokraie et al., PLoS ONE 7(9): e45682. They are also surprisingly cute for a microscopic animal, and they are colloquially known as water bears, moss piglets, or space bears. "Space bears" comes from their ability to survive in extreme environments, possibly including interplanetary space. Star Trek Discovery's tardigrade is, shall we say, rather different. It looks a bit like the picture shown here, but it's the size of a large grizzly bear, incredibly strong, and extremely fierce. On the show they call it a "giant space tardigrade." But that's not all. 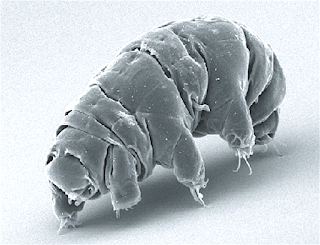 Thanks to a unique biological property that the show's writers apparently misunderstood, the space tardigrade can access the mushroom network to travel throughout the universe, wherever and whenever it chooses. "Like its microscopic cousins on Earth, the tardigrade is able to incorporate foreign DNA into its own genome via horizontal gene transfer. When Ripper [the space tardigrade] borrows DNA from the mycelium [the mushroom], he's granted an all-access travel pass." And just like that, not only the tardigrade but the entire spaceship jump across the galaxy. Is this sounding a bit crazy? It should. Horizontal gene transfer (HGT) is a real thing. It's a process through which bacteria sometimes take up DNA from the environment and integrate it into their own genomes. Animals can't do HGT, but rather infamously, a paper was published in December 2015 that made the bold claim that tardigrades had a unique ability to absorb all kinds of DNA. That paper was instantly controversial in the scientific community, and not surprisingly its findings were being disputed in the Twittersphere within days of its appearance. Surprisingly, the same journal (PNAS) that published the bogus HGT claim published a second paper just a few months later showing that tardigrades do not absorb foreign DNA into their genome. That plus a third paper showed that the original paper had mistakenly identified contaminating DNA as part of the tardigrade's own genome. This rapid correction of the record was a win for science; I've used this example to demonstrate to my undergraduate class how sloppy science (the first paper) can lead one astray. So: a minor scientific controversy, quickly debunked. Until, that is, one of the Star Trek writers got their hands on it. Apparently one of them heard the tardigrade story, perhaps someone who'd had a bit of biology in college (I'm guessing here), and got so excited that they turned it into a wildly implausible premise for an intergalactic space drive. The idea of using horizontally transferred DNA for space travel is so nutty, so bad, that it's not even wrong. Even if tardigrades could absorb foreign DNA (they can't), how the heck is this supposed to give them the ability to tap into the (wildly implausible) intergalactic spore network? DNA that's been taken up through HGT isn't connected to the source any longer. This is no more plausible than asserting that people could connect to the mushroom network by eating a plate of mushrooms. And how would the space-traveling tardigrade take the entire ship with it? Are we supposed to assume it's creating some kind of mushroom-DNA field? Star Trek has had faster-than-light warp drives for 50 years. Although physically implausible, warp drive isn't laughably ridiculous. The DASH drive is. And now the entire series seems to be based on a combination of magic (an intergalactic mushroom network in subspace) and scientific errors (horizontal gene transfer by tardigrades). I can't watch this nonsense. I'm willing to suspend disbelief for the sake of a good story (warp drive! ), but I can't accept obviously bogus claims. I don't know how the Star Trek writers can get themselves out of this one, but if they don't, then Star Trek Discovery is finished. If they're reading this, here's my plea: ditch the DASH drive and find something to replace it–and for god's sake, hire a competent science consultant. There's lots of problems with Star Trek Discovery, but bad biology had *always* been a problem in Star Trek. 1) The original series established that Spock 1) had copper-based blood like a mollusk as Vulcans apparently do 2) was half human. How can humans and Vulcans have viable offspring? Even ignoring the blood issue, how would their genetics be anywhere near compatible? 2) The movie "Star Trek III: The Search for Spock" suggested that the clone of Spock created by the Genesis Device would have all the memories of the original Spock. Obviously, cloning doesn't work that way. Science has never been the purpose of Star Trek -- at its best, it is really talking about current society using SF metaphors to get people to think beyond their own political biases. True, true. But the problem with the new series is that the very premise of the show - the purpose of the ship Discovery - is based on biological errors. Spock's copper-based blood (for example) was a peripheral matter. The spore is not the premise of the show. It is rather literally a plot device. I think your background as a biologist is causing you to hyperfocus here. A materials scientist could be equally appalled by the idea of dilithium(how could somethings molecular structure somehow enable it to withstand being bathed in high-energy gamma rays?? )but this is just as beside the point. The premise of the new show as a whole might be said to be something about, war, regret, redemption, the cultural Other or whatever. It sure ain't science.